The high and mighty in the oil and gas industry in the country were on ground for the epoch making event which has started transforming the predominantly farming community into a major gas hub and a cosmopolitan city. Continuing, he said the plant signpost the nation’s engineering prowess and local content capacity . He further commended the promoter of the project, Engr Charles Osezua , Chairman Owel-linkso group for the initiative , noting that this was not his first voyage into gas distribution project in the country. “This is not your first start up . You had done it before with Gaslink that started gas distribution in the Ikeja, Lagos area which has spread to Apapa and beyond”, he noted. 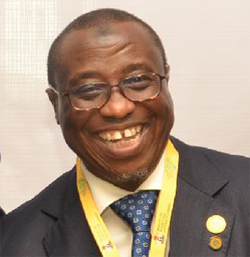 Dr Baru also urged gas operators that are close to the Egbaoma gas plant to come together to supply gas to the plant to maximize its capacity to commercialize flared gas, stressing that the move will be one of the key steps towards ending gas flare in the country. He also said steps were on to effectively monetize gas resources for national economic growth. “ I also wish to use this medium to assure Deltans and Nigerians that the journey to effective monetization of our vast gas resources for sustainable economic growth and complete end to gas flaring is underway and the future is very bright “, he said. Chairman of Owel-Linkso, promoter of Gas train and Director in PNG Gas limited , driver of the project , Engr Osezua in his remark earlier thanked Ebedei community for its friendliness and peaceful disposition towards the project which took off in the area five years ago. He added that Egbaoma which is entirely an indigenous gas processing plant has produced about 35,000 metric tones of gas for the nation’s domestic market since it took off. He said about five hundred homes currently utilize the LPG from the plant , adding that they have also stimulated interest among Nigerians to buy propane for use. Mr Gabriel Elere who also spoke gave an overview of the plant. The gas processing plant has started creating indirect employment in the hood with eateries and petty shops already springing up around the plant to serve staff. Vanguard also gathered that locals have been engaged for various jobs by drivers of the project.